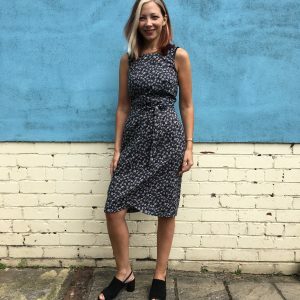 I absolutely fell in love with the latest pattern release from the girls at By Hand London – the Orsola dress and skirt. 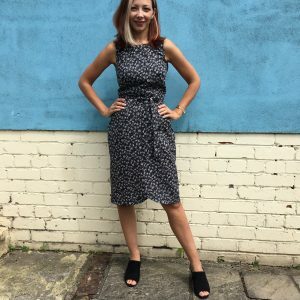 It is a unique take on a shift dress that means you put in on almost like an apron and it wraps at the back and ties at the front – no zips, buttons or anything! What I particularly loved was the deep v of the back neckline and the stunning scalloped hem. Fabric recommendations for the Orsola are quite drapey fabrics, such as viscose. 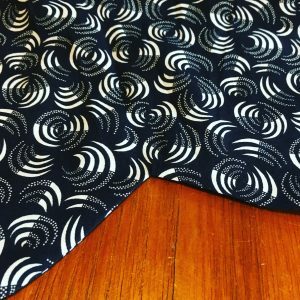 I chose to make mine in a cotton lawn from Liberty as, with all of the bias cut edges, I wanted to use something a bit more stable. Plus, I had just bought this gorgeous black and white print in the recent Liberty sale, and thought it would be perfect. 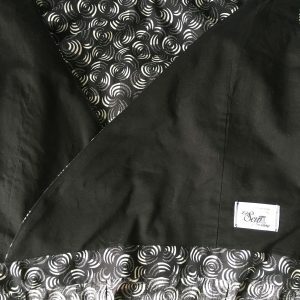 I decided to line the bodice with plain black cotton lawn, to save some of the Liberty fabric for another project. It was really easy to fit into much less fabric than the pattern suggested – probably less than 2 metres. There is a wide facing that runs along the entire curved hem. I did initially think that I would scrap the facing and use bias binding instead, however, on second look, I decided that this would be much harder to do as I wanted to make the version with the front scallop, so I stuck to the original instructions. I do think that you could use bias binding on the non-scalloped version though. It may be helpful to draw a stitching guide for the scalloped hem to make sure you get an even curve. Sew the hem with the facing side towards you. Topstitch the hem with the facing towards you, otherwise the main fabric can bunch up a little if that is on top. It may also be worth using a walking foot for this stage. 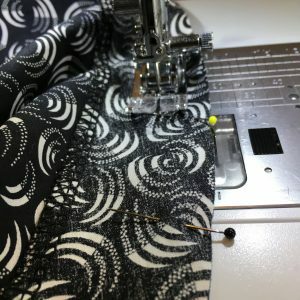 Take the time to do all of the stay stitching advised at the start of the pattern – these details will make all of the difference and prevent any stretching out. There are 18 darts to sew in total (!) Mark and pin them all out and batch sew them in the beginning for greater efficiency. Press the lining darts in the opposite direction to the main fabric darts. This means that you will have less bulk at the seams. Overall, I am absolutely thrilled with this dress. I really enjoyed the process of making it. I think the fit is brilliant and really true to size. I love that it is a smart dress that can be worn to work, or out to dinner. 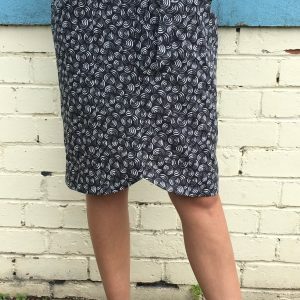 I actually don’t have that many darker items in my handmade wardrobe so I am really pleased with this combination, especially as it means that I can wear it in the summer, but also in the winter with tights and a cardi. I love the way you can synch it in or let it out, using the waist tie, as needed. The crossover back and scalloped hem details are what really sets this pattern apart and make it a really special dress. Well done to the girls at By Hand London! I love this dress and have been considering making it myself. Do you find that both the low cut of the back of this dress and the strap shape mean wearing a strapless bra?